Hard Case Crime publishes great hardboiled crime fiction that ranges from lost noir masterpieces to new novels by today’s best crime writers. A notible feature of Hard Case Crime novels are their book covers that featuring original cover art in the grand old pulp style. They remind me of the crime novels I read as a kid in the early 1960s. 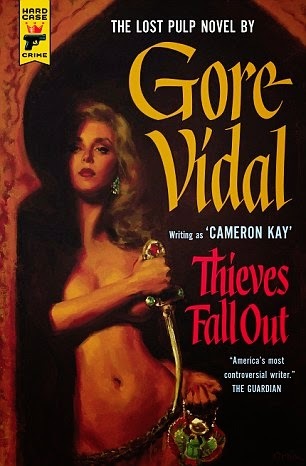 Hard Case Crime has now published a crime novel called Thieves Fall Out, which was written by the late Gore Vidal when he was a young man. Although I don't subscribe to Vidal's world-view and politics, I think he was a good writer and I enjoyed his historical novels Lincoln and Burr. Geoffrey Wansell at the British newspaper the Daily Mail offers a review of Vidal's Thieves Fall Out. An unpublished gem of pulp fiction by the late literary master Goral Vidal, aged 28, and unavailable for 60 years, this is an absolute delight from start to finish. Using the pseudoym of his great-uncle, Vidal elegantly paints a vivid portrait of Egypt in the years of King Farouk in the 1950s, when everything in Cariro was laced with treachery and every person stained indelibly with the taint of corruption.